Nothing represents fall in Illinois like apple picking in a beautiful orchard followed by a snack of fresh apple cider doughnuts. There are many great apple picking spots throughout the state, each offering a unique experience for guests. Some of these orchards provide kid-friendly activities such as wagon rides and farm animals, while others are more centered around apple picking and homemade treats. 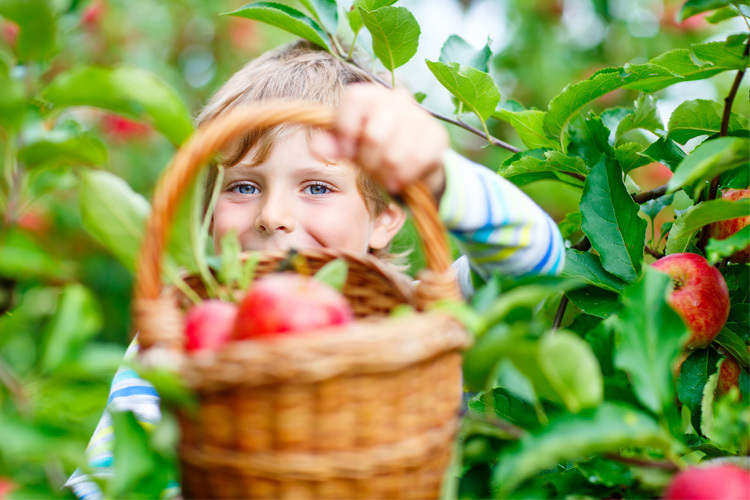 For fresh, delicious apples, check out these 10 great apple picking spots in Illinois! Mills Apple Farm is a family-owned orchard that aims to make their guests feel welcome and comfortable. They offer many free kid-friendly activities such as wagon rides, play areas, and animals to visit. Guests can pick their own apples without paying an admission fee, and they also grow pumpkins, peaches, sweet cherries, and Christmas trees. Don’t forget to check out their fresh-baked goods, as well. Apples on Oak offers a wide variety of apples that aren’t found in grocery stores. This orchard boasts over 700 trees and around 100 different varieties of apples, many of which are available for picking. Visitors can pick the apples from August to early October. However, you have to come early because these apples go quickly. This family-owned and operated orchard is known for their friendly service and commitment to quality. Established in 1965, Honey Hill Orchard has over 2,100 trees and allows guests to pick apples, pumpkins, and raspberries. They also feature a great selection of specialty foods such as apple cider, fresh honey, homemade caramel apples, fresh produces, maple syrups, and delicious sales in their Apple Barn Country Store. Apple picking starts on Labor Day weekend at the Jonamac Orchard. This family-owned orchard has been in business for since 1984 and continues to expand. There are no admission fees to pick from the orchard, but you must purchase an apple-picking bag before accessing the orchard. Jonamac Orchard also offers many kid-friendly activities like a corn maze and pumpkin patch. Known for their award-winning apple ciders and cider slushies, Edwards Apple Orchard is a friendly apple-picking spot worth checking out. With over 18 varieties of apples to pick, you’re sure to discover unique flavors not found in stores. Guests also rave over the fresh, delicious doughnuts each year. Choose from over 17 varieties of apples to pick at Tanners Orchard. Established in 1947, this family-owned orchard features over 11,000 trees and over 20 acres of pumpkins, which are also available for picking. Take a covered wagon ride through the orchard and pick their delicious apples right from the trees. They do charge a small admission fee in addition to their peck fees. Recognized for their apple cider doughnuts and other scrumptious baked goods, Valley Orchard is the ultimate fall destination. They offer wagon tours of the orchard, which contains over a wide selection of apples to pick. Their bakery is available in the fall and features delicious treats such as caramel apples, apple cinnamon bread, fudge, homemade apple pie, and of course apple cider doughnuts. Choose from a wide variety of apples to pick at Homestead Orchard in Woodstock. This quiet orchard is nestled in the countryside and features one of the largest and oldest maple trees in the county. Their store is in an 1880s horse barn and features homemade honey, beeswax candles, glassware, hand-crafted items, and even a separate room with World War II memorabilia. For the ultimate kid-friendly apple-picking experience, look no further than Kuipers Family Farm. This 230-acre farm allows visitors to pick their own apples every weekend mid-August through October. They offer 14 varieties of apples and many family-friendly activities including a pumpkin patch, hay rides, petting zoo, events, and much more. If you prefer a peaceful orchard setting without any carnival extravaganza, head to Woodstock Country Orchard. They offer around 13 varieties of apples for picking from early September through mid-October.